Little information survives about the life of the Venerable Andrei Rublev, Russia’s greatest iconographer. It is not known where he was born, though it was probably near Moscow. He probably lived in the Trinity-Saint Sergius Lavra near Moscow under Saint Nikon of Radonezh (Nov. 17), who became abbot after the death of Saint Sergius of Radonezh (Sept. 25) in 1392. The first mention of Rublev is in 1405 when he decorated icons and frescos for the Cathedral of the Annunciation of the Moscow Kremlin in company with Theophanes the Greek and Prokhor of Gorodets. His name was the last of the list of masters as the junior both by rank and by age. 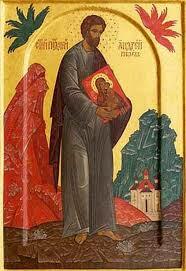 Theophanes was an important Byzantine master who moved to Russia, and is considered to have trained Rublev. Sometime before 1405 he moved to the Spaso-Andronikov Monastery founded by Saint Andronicus (June 13), with the blessing of Saint Nikon. There Andrei received monastic tonsure and was taught iconography by Theophanes the Greek and the monk Daniel, Saint Andrew’s friend and fellow-ascetic. His next important project, which he undertook with the monk Daniel, was to paint the frescoes in the Dormition Cathedral in Vladimir in 1408. Nikon of Radonezh asked Andrei and Daniel to paint the new church in the reconstructed Monastery of the Holy Trinity, which had been destroyed by the Tatars in 1408. 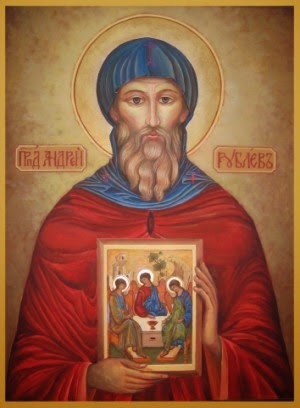 At this time Andrei painted his most famous icon: the Holy Trinity (actually, the Hospitality of Abraham), which is the only work authenticated as entirely his (c. 1410, currently in the Tretyakov Gallery, Moscow). Rublev removed the figures of Abraham and Sarah from the scene, and through a subtle use of composition and symbolism changed the subject to focus on the Mystery of the Trinity. After Daniel's death, Andrei came to Moscow's Andronikov Monastery where he painted his last work, the frescoes of the Savior Cathedral. He is also believed to have painted at least one of the miniatures in the Khitrovo Gospels. In Rublev's art two traditions are combined: the highest asceticism and the classic harmony of Byzantine mannerism. The characters of his paintings are always peaceful and calm. After some time his art came to be perceived as the ideal of Russian Orthodox painting and iconography. Saint Andrei fell asleep in the Lord on 29 January 1430 (although 17 October 1428 is also cited) at Andronikov Monastery, and was buried there. He was over seventy years old at the time of his death. The monk Daniel, who died before Saint Andrei, had appeared to his friend and urged him to join him in eternal blessedness. Since 1959 the Andrei Rublev Museum at the Andronikov Monastery has displayed his and related art. In 1966, Andrei Tarkovsky made a film Andrei Rublev, loosely based on the artist's life. This became the first (and perhaps only) film produced in the Soviet era to treat the artist as a world-historic figure and Christianity as an axiom of Russia’s historical identity, during a turbulent period in the history of Russia. A crater on the planet Mercury is also named after him. The Russian Orthodox Church canonized Rublev as a Saint on 6 June 1988, celebrating his feast day on 29 January and/or on 4 July. Shining with the rays of divine light, O venerable Andrei, you knew Christ the wisdom and power of God. By means of the image of the Holy Trinity, you preached to all the world the Holy Trinity in unity. And we, with amazement and joy, cry out to you: As you have boldness before the Most Holy Trinity, pray that the Uncreated Light, may illumine our souls. Like a trumpet, you clearly sounded the sweetness of divine hymns, and were revealed as a brilliant beacon shining on the world with the light of the Trinity. 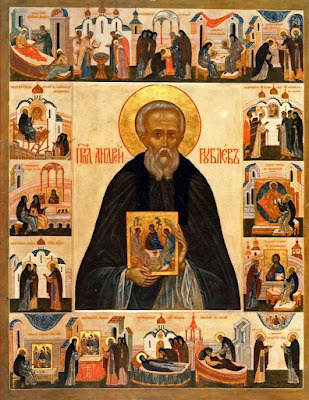 Therefore, we all cry to you, venerable Andrei, unceasingly pray for us all.